The Congress screened at the Melbourne International Film Festival on the 28th of July and 8th of August 2013. The Congress is a film like no other. With it's combination of live action and animation, The Congress is incredibly creative and original and is visually an absolute masterpiece. However, you can count on one thing when it comes to The Congress, and that is that opinions will absolutely be divided. Some people will love it for it's creativity and original take on the future, will others will find it's surrealistic elements just too strange and bizarre to tolerate. 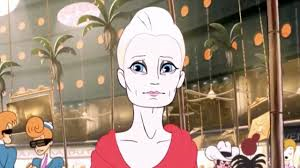 Robin Wright (played by herself) is an actress faced with the reality that she has not made a decent film in 15 years and is unsure what where her career is going. Her manager, Al (Harvey Keitel) comes to her with an offer that would see her signing her life away to the studio as a result of the changing face of the film business. This decision affects Robin in ways going into the future that she, nor anybody else, ever would have considered possible. Based on the novel by Stanislaw Lam, "The Futurological Congress", The Congress is really one of a kind. It can be described as sci-fi in it's futuristic qualities. 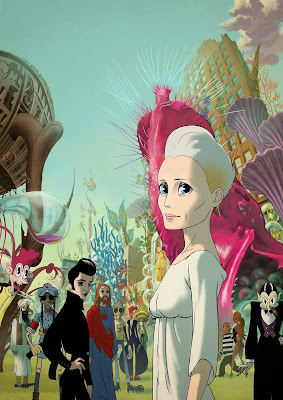 The future in the film is represented by animation and with this animation comes the ability to create a more surrealistic feel to the film, as there is so much more which animation is capable of when creating this world. It is able to do things for the visuals of the film which CGI still would not be able to accomplish. As a result of this mix of live action and animation to tell the story about the future of the film business and then the future of human kind, The Congress is not like any other film. It is completely intriguing and very, very clever. However, it is the content and visuals combined that will make this film just too strange for some to tolerate a full viewing of. Many of the futuristic scenes contain some very surreal images, especially when Robin inhales hallucinogenic fumes (that could well speak for itself) and the many of the scenes that follow that. If surrealism in film doesn't interest you and you don't find it entertaining, than The Congress will not do anything for you. Indeed it is something you need to be open to and accept in order to see the beauty of the film. The animated scenes are visually brilliant. The colours used are exquisite and overwhelming in the emotions which they themselves are capable of evoking. What is so incredible about the animation, is that it is not just the main characters and objects that receive the most attention, but everything around them. There is so much going on in each scene that it is impossible just to concentrate on one item or character. One such scene is where Robin and Dylan (voiced by Jon Hamm) are in the restaurant and there are many animated versions of well known personalities wandering around in the background, which is a real treat to try and spot as many as you can! Robin Wright is the centre of the film. She is really quite wonderful in all the live action scenes of the film which she is in. Her performance, in both the live action and the animation which she lends her voice to, is really very melancholy and she never really seems very happy, which after awhile can become quite distressing to watch. Harvey Keitel is very good in the scenes which he is in. He has one really incredible scene in which he goes from telling and amusing and funny story to ending up in heartbreaking tears. Kodi Smit-McPhee also does well as Robin's unwell son and Sami Gayle does well as her sassy daughter, Sarah. The Congress will definitely prove a little too weird for some, but for those who are open to the concept of surrealism and the marriage of that surrealism with animation, they will have a wonderful treat.